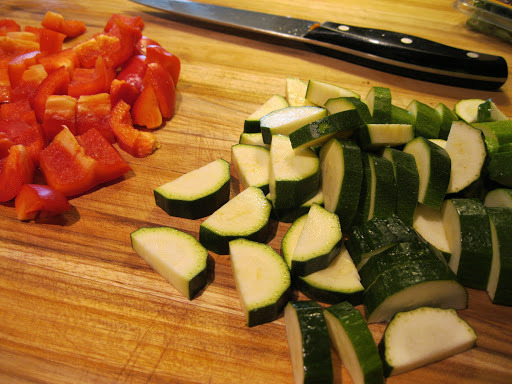 Ratatouille is a medley of vegetables, sauteed, baked or stewed into a savory side dish. The traditional version calls for a base of tomatoes, eggplant and basil. My nontraditional version searches for the balance of winter to spring, light to dark, and earthy to bright. Around this time of year, February, I get that aching in my bones for warmth and sun. Potatoes and hearty root vegetables feel too heavy, lethargic almost. I need bright food and sunshine. Winter Ratatouille has seasonal elements, tomato is substituted for carrot, sage for basil. Warm olive oil coaxes onions to stew in my cast-iron pan as chard is introduced to the heat. I finish it with a dash of fresh, fruity olive oil and a squeeze of lemon, allowing citrus to wake up my food and mind. Spring is just around the corner. Until then, we dine together and toast to the Sun. Foodie Note: Make this into a meal by topping the vegetables with cooked lentils or black beans. 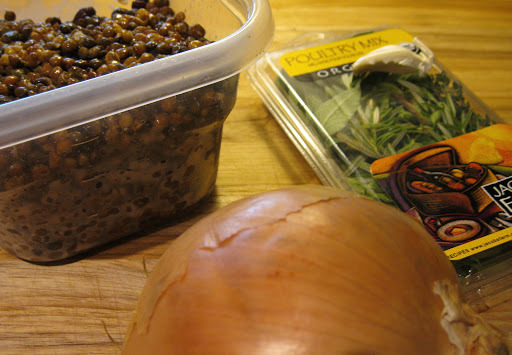 Trader Joe’s has cooked lentils in the refrigerated section, which I purchase often and highly recommend. Slice all vegetables into similar sized pieces, about 1/2″ thick. Heat olive oil in a large cast iron pan to medium high heat, add onions and saute for about 5 minutes, reducing heat to medium as onions begin to brown. 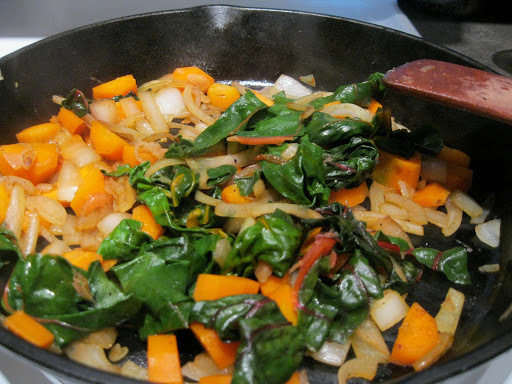 Add chard and carrots, sage, rosemary, 1/4 teaspoon salt and pepper, saute for 3 minutes. Add garlic, zucchini and bell pepper. 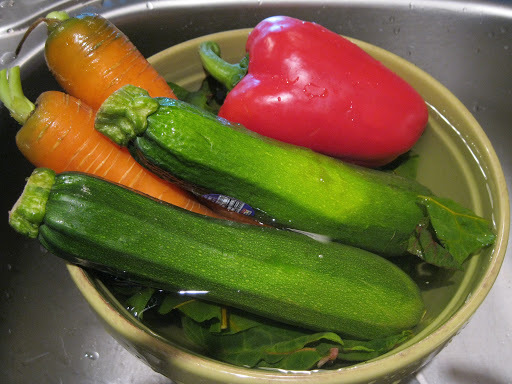 If vegetables seem dry, add a tablespoon of water. Cook 10-12 minutes, until vegetables are soft and brown, but carrots have a slight bite. Season with salt/pepper. 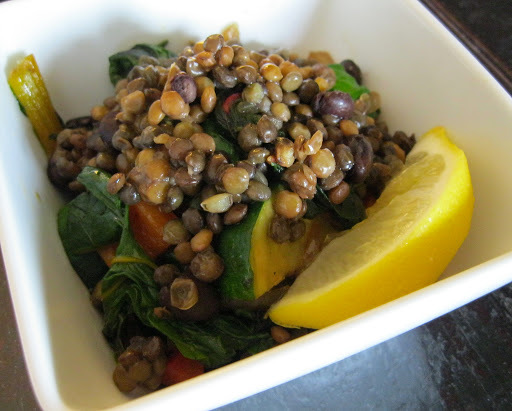 Portion into bowls, drizzle with good extra-virgin olive oil and serve with a fresh wedge of lemon. 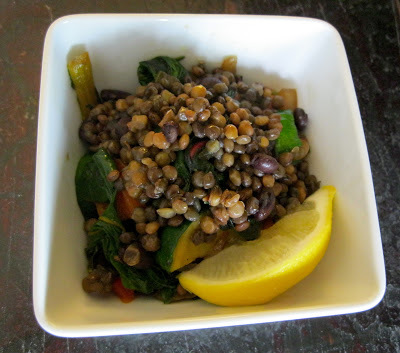 Top ratatouille with a few spoonfuls of cooked lentils to complete the meal.